Yes, I’m an entrepreneur, iOS/Mac/.NET/Qt developer, community influencer. I’m a very fast learner, problem solver, movie freak, gadget freak, Siberian Husky and Golden Retriever owner. Also proudly the first BMW 328i Sport F30 owner in Bandung. As an entrepreneur, I have found four software companies since 2003. The last one is DyCode, my current company, has been around for almost 6 years now. The two of three previous companies have died, the third is still around, yet I didn’t involve anymore. I co-founded DyCode in 2007 with 5 other founders. Now, I’m the only survivor out of original founders, but recently two new co-founders jumped in to the ship. As a developer, I’ve been coding since 15 years old, it’s half of my life now. I’ve coded in almost all well-known languages and frameworks, Assembly, Pascal, Basic, Shell scripting, PHP, C, C++, Java, Oracle PL/SQL, Visual Basic, .NET (VB.NET and C#), Objective-C, you name it! That’s because of my passion of the new stuffs in software development (in anything actually), and always adopt new technology both for myself and my company. Recently though, my interests are mostly in Objective-C (iOS mostly), .NET, and Qt (in that order). As a software development professional, I’ve been managing and developing more than 40 software projects. As a community influencer, I’ve helped establishing of some developer communities, like Microsoft User Group Indonesia (MUGI) – Bandung chapter, Indonesia .NET Developer Community, and Nokia Indonesia Community & Enthusiasts (NICE). Not only them, with friends at BeetleBox, I co-founded the first and the biggest iOS/Mac developer community in Indonesia named id-Objective-C. I’ve been serving as the president of id-Objective-C since April 2011. You can hire me through my companies: DyCode or DycodeX. and tell me how much time and cost would be if I want to rebuild the client side app from the ground app on both IOS and Android. Using our IOS and Android SDKs that fully connects to our servers. 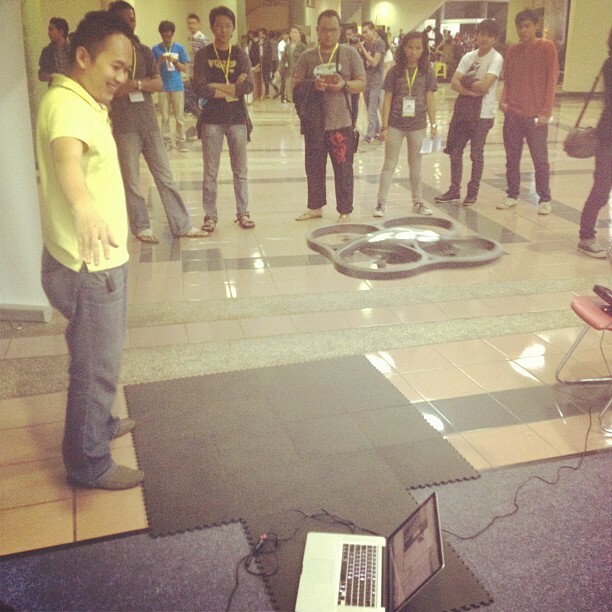 Saya menggunakan 2 program untuk menghubungkan Ar Drone dgn kinect, IDE yang saya gunakan adalah VS 2010 (C#) untuk kinect dan VS 2008 (C++) untuk Ar Drone, sejauh ini kedua program saya hubungkan menggunakan library input simulator keyboard pada VS 2010 untuk memberi perintah pada VS 2008. Jadi kedua program saya run, lalu program VS 2010 seolah-olah memberi penekanan tombol keyboard pada program VS 2008 yang sedang me-running program Ar Drone. Dulu saya pakai C# baik untuk gesture recognition dari Kinect maupun koneksi ke AR.Drone. Untuk Kinect, tinggal pakai Kinect SDK. Untuk ngontrol AR.Drone, pakai https://github.com/shtejv/ARDrone-Control-.NET, tapi di-custom lagi untuk effectively “ngobrol” dengan Kinect. Hanya saja sy bingung utk mengkombinasikan dgn program kinect, kira-kira bagian mana ya yang harus saya modif? ya kira2 biar gesture yg ditangkap kinect bisa kasih command ke pitch, roll, yaw, dan gaz nya si Ar Drone. Justru bagian itu yang perlu dimodif, bagian yang meng-capture Kinect gesture dan diterjemahkan ke controlling AR.Drone. Banyak sample project untuk capture Kinect gesture. Setelah tertangkap, pilihan kita untuk men-translate 1 gesture ke 1 gerakan (pitch, roll, etc) Drone. mas andri, saya ada project tentang ar-drone tapi menggunakan node.js, untuk di indonesia sendiri forum/komunitas yang menggunakan node.js untuk controller ar-drone forum/komunitas apa ya? Sya ada sedikit kendala saat programming dengan XCode 5, sya develop app kecil untuk environtment IOS7, kenapa yah..setiap sya mau kasih background dengan format .png / .jpg saat dicoba pake simulator IOS7 gambarnya blank. Kira2 itu penyebabnya apa y mas…mhn pencerannya y mas andri.